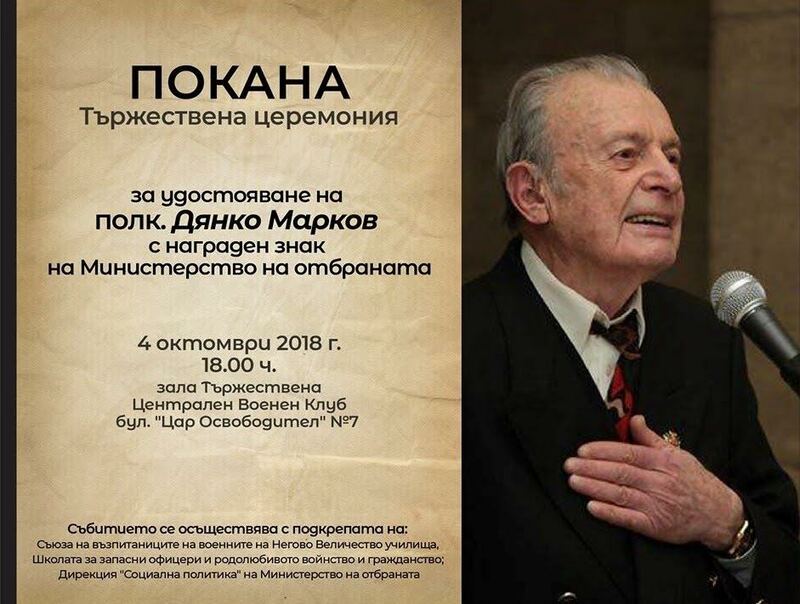 Bulgaria’s Defence Ministry went ahead with conferring honours on Dyanko Markov, a 96-year-old veteran of the Union of Bulgarian National Legions, in spite of Bulgarian Jewish organisations having said that they found the honour unacceptable. Union of Bulgarian National Legions was headed in the 1930s and 1940s by Hristo Lukov, a pro-Nazi general in whose honour a torchlight procession is held annually in Sofia, attracting neo-Nazis from elsewhere in Europe. Markov has denied it was a fascist organisation, calling it “nationalist”. Markov has lost court actions that he lodged against Yuliana Metodieva, editor-in-chief at human rights NGO and features website Marginalia, after she described him in writing as an antisemite. He was also controversial for his statements in Parliament in 2000 when, referring to the deportation of the Jews from the “new lands” in northern Greece and Yugoslavia – said: “The deportation of a hostile population is not a war crime. The United States deported the Pacific coastal population of Japanese origin during the Second World War. And no one gave a damn about it”. The more than 11 000 Jews deported from the “new lands”, then under Bulgarian administration, were murdered in 1943 at the Nazi death camp Treblinka. The Organization of the Jews in Bulgaria “Shalom” said that Dyanko Markov’s life was inextricably linked to the Union of Bulgarian National Legions, a fact that he was proud of. “Shalom” said that under Lukov’s leadership, the legion had issued a programme for 1943 that included as its first point, “to fight those ruining the Bulgarian national state, in the form of Jewry”. The Sofia Lodge Carmel 3355 of B’nai B’rith said in a statement ahead of the ceremony conferring the honour on Markov that the Paris Peace Treaty bound Bulgaria to dissolve all fascist-type organisations on its territory and to not allow the future existence of such organisations. The award to a member of the Union of the Bulgarian National Legions was a direct violation of this article, the organisation said. “The planned award institutionalises the glorification of individuals with a Nazi past and present and places the Republic of Bulgaria in the shameful list of countries where Nazism and fascism find government-approved attitudes,” it said. It said that it was no surprise, given that “one year after Prime Minister Borissov’s order to dismiss Hitler’s follower Ivo Antonov, he continues to be member of the Ministry of Defence of the Republic of Bulgaria,” the organisation said. In May 2017, Antonov, who is head of the social affairs directorate of the Bulgarian Defence Minis­try, publicly apologised after a photograph emerged of him giving a Hitler salute next to a Second World War German Maybach tank in the grounds of the Military History Museum. Bulgarian Prime Minis­ter Boiko Borissov had called for Antonov to be dis­missed. However, the political principal of the minis­try, Defence Minister Krassimir Karakachanov – a co-leader of the United Patriots, the far-right grouping that is the minority partner in government – did not act on Borissov’s request. The social affairs directorate at the Defence Ministry was listed on the official invitation to the October 4 2018 ceremony honouring Markov as one of the supporters of the event. In political quarters in Bulgaria, there was division between left and right as Markov’s 96th birthday came up. In a Facebook post, socialist MP Alexander Simov said that the Defence Ministry honour for Markov was “a disgrace, dishonesty and rehabilitation of the darkest pages of Bulgarian history”. In a message posted on Markov’s Facebook page, Andrei Kovachev, a member of the European Parliament for Borissov’s centre-right GERB party, expressed his heartfelt wishes on Markov’s birthday. This was a reference to Markov’s role in the air force during the Second World War. In its October 3 statement, “Shalom” said that military feats do not erase the ideology that marked almost every aspect of Markov’s life. According to a report by Balkan Insight, the Defence Ministry said on October 4 that it saw nothing wrong with its decision to give the award to Markov, and refused to comment on the specific positions of the two objecting organisations.